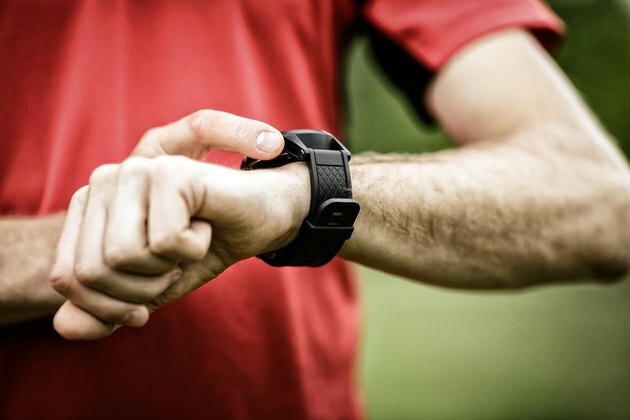 Checking your pulse during and after exercise can provide pretty accurate assessment of your overall fitness. This is because the more physically fit you are, the faster your body recovers and heart rate returns to its normal level. Your heart rate recovery is a measure of how fast your body returns to its normal resting state following exercise. The normal resting heart rate for the average adult is 60 to 80 beats per minute. This holds true for a 44-year-old male, but the normal post-exercise heart rate for a male in his mid-40s is dependent upon fitness level and heart health. A major study conducted in 1999 and published in "The New England Journal of Medicine" studied heart rate recovery and how it relates to mortality. Participants exercised at high intensity and compared their exercise heart rate with their heart rate one minute after the exercise was completed. Based on the findings, a decrease in post-exercise heart rate of 12 BPM or less was considered unhealthy; 15 to 20 BPM was about average; and more than 20 BPM was a sign of a strong heart and low rate of mortality over the long term. About a minute following moderately-intense exercise, your heart rate should drop by about 15 to 20 BPM and then continue dropping at a steady pace. A heart rate recovery below this range could be a sign of poor heart function, overtraining or poor physical health. It will take several hours for your heart rate to completely return back to its normal resting rate. Following a high-intensity workout it may take 24 hours or longer for your heart to return to its normal resting heart rate. Your pulse should still come down 15 to 20 BPM a few minutes after the workout is done, but will remain slightly elevated for hours. The reason for this longer recovery time is that the high-intensity nature of the workout stimulates an aerobic and anaerobic effect on your body – sort of a double whammy. This causes an increase in hormone release, such as growth hormone and testosterone, as well as increased protein synthesis and increased heart rate during exercise. Collectively, this helps burn calories at a higher-than-normal rate and keeps your heart rate elevated for long periods of time. Because of this, you should consult your doctor before trying high-intensity training. If your heart rate remains steadily elevated or increases post-exercise this may be a sign of a problem. You should consult your doctor. What you're looking for is a rapid decrease in heart rate during the first couple minutes following exercise down to normal levels of 60 to 80 BPM. Check your pulse every three to five minutes following your workout to ensure your pulse steadily decreases back down to normal.